To read the previous part click here. We had decided to go to Padiyar Swami's house in Kushal Nagar that was just a kilometer from the ashram. There was a strange thing that had happened last time (read more on that). Ganapathyji was the one who lived in Padiyar Swami's house and took care of it. 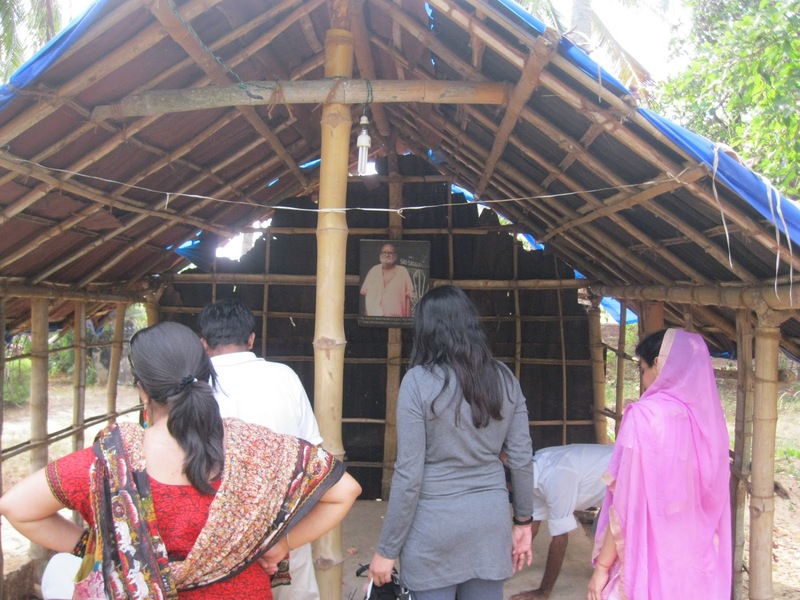 He had taken us there last but this time was on padhyatra (journey on foot) from Kanhangad to Ganeshpuri in a span of 40 days and had left the ashram a few days before we came. However, Ganapathyji had called me while on his yatra and told me that the keys would be arranged for us after i had kept a request with him on our eagerness to meditate there. He was kind enough to do the arrangement and also called me to check. Last time in Padiyar Swami's house, while we were departing he had told me that he would introduce me to a person soon and on asking who he never answered any further and was only smiling. So that was the mystery for me, which got solved in this visit. So, in the afternoon after spending some time in the caves, we all left by walk to Padiyar Swami's house. Aunty, as usual picked two hand bags and carried them with great effort. As we were walking on the railways tracks, i asked aunty why she was carrying all this heavy load to which she said there are eatables for everyone in that and also some other things. i told her , "Watch out, apart from your asana you will not be taking out anything else and you are simply carrying all that heavy stuff." 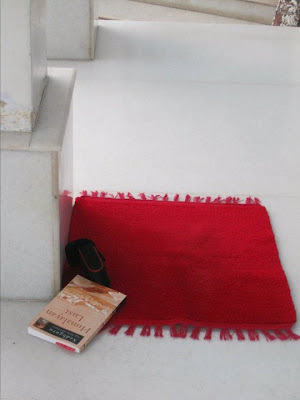 It was only later i realized that while at Padiyar Swami's samadhi, it was the articles that aunty carried came handy for the arati there and so were the eatables. i felt a little bad as she was so lovingly carrying those eatables for us all. She had carried what came naturally to her and i had poked my nose into that... dirty logics.. lol.. i told her how right was this and she gave me a cute shy smile..
Before we reached Padiyar swami's house, we went and sat around the round table that was built by Baba during the historic Round Table Conference in London. Baba used to sit here and tell the assembled people there about details of the conference happening in London, which the people were surprised to read in the next day's newspapers. We just sat there and felt the energies for a while. The climate, the surroundings, the sun between the shades of the tree all made it very pleasant. It gives a very beautiful feeling to know that Bade baba once sat in this place. Then, a few steps from here is Padiyar Swami's house. We meditated here for a while and visited the Ayappa temple in the same premises. 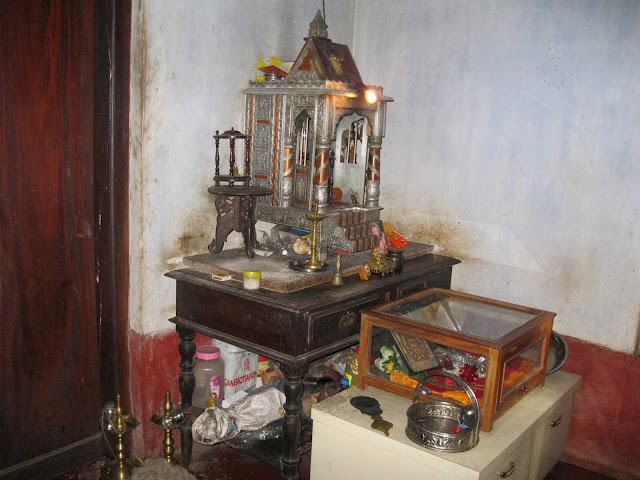 We went to his samadhi, cleaned up a bit and lit the lamp that was off along with some incense sticks. It was not burning since Ganapathyji was away. Then we walked to the house with the key that they had with so much of trust given it to us without even anyone from the ashram assisting us, since it is a huge house still containing all of Swamiji's articles kept as it was. This was all on Ganapathyji's assurance. 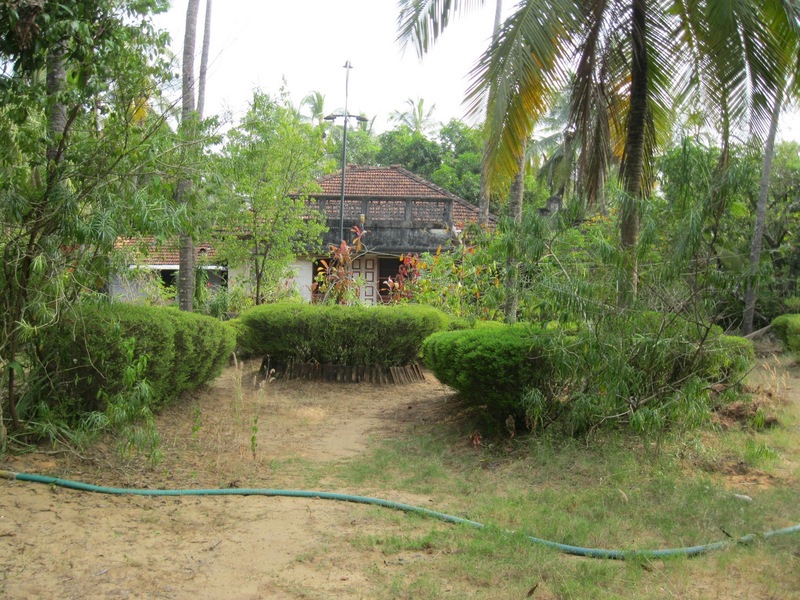 The samadhi is within the compound of the house named as "Gopal Sadan". As i opened the door and walked in the same cool atmosphere and divine serenity immediately engulfed. Each and everyone sensed this and as i showed all around the house, each preferred to sit down where they felt like. 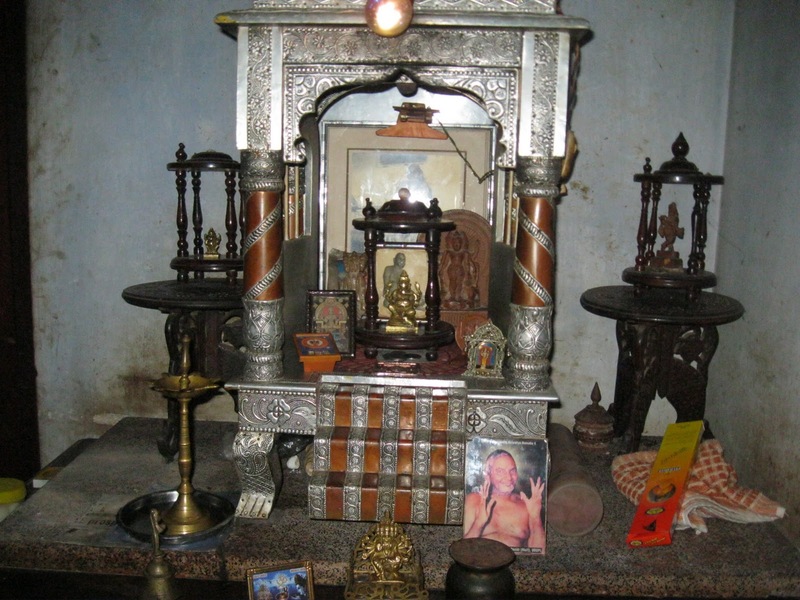 There was the pooja room, the TV room, hall, kitchen, two other rooms and Swamiji's bedroom, where his belongings still were neatly kept along with his walking staffs. Soon all of us settled down in three rooms to meditate. The vibrations were are awesome and one can easily get into meditation here. After a while of serene meditation something just put my eyes wide open and i looked around. All were in deep trance state. Something prompted me to take a video of this house and everyone and i did it. All the short clips of the trip we could capture are put in a video at the end of this article. The photo of the yogi in red frame is the one who does not eat or drink anything. Ganapathyji had told me about his in the last visit and that Bade Baba had predicted him to live for 124 years. Then a curious person came up to check out as he saw the doors open. On enquiry we told him how we were there and he left us alone. Soon it was time as we had to go to Anand ashram also that evening, which is a few kilometers away. This ashram was founded by Swami Ramdas in 1939. We also had to buy flowers for the next day early morning's Milk Abhishekam. We walked our way back again through those tracks and entered through the backside of the ashram. Bade Baba loved trains and that is probably why he built this ashram here. 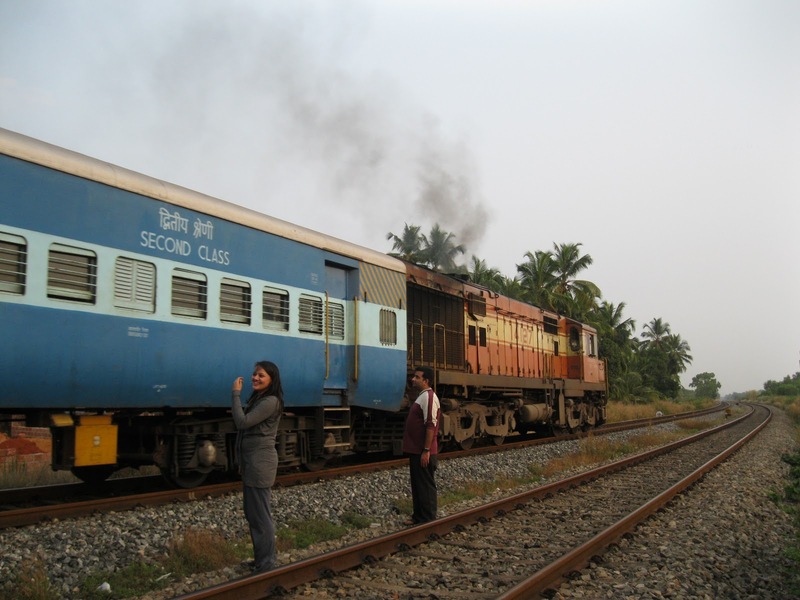 It was here that Bade Baba had performed many miracles like stopping trains, appearing in two different places, producing tickets of even future dates to rude ticket checkers. When he raised his hands to stop a bus and the driver purposely did not stop, the driver was shocked to see Bade Baba raising his hand at every stop until he finally realized, apologized and pleaded Bade Baba in. Back at the ashram as everyone were booking for homam, i heard some melodious bhajans coming from the room where Swami Janananda stayed and i knew it was some live music. i ran there and found three old people singing and playing music. 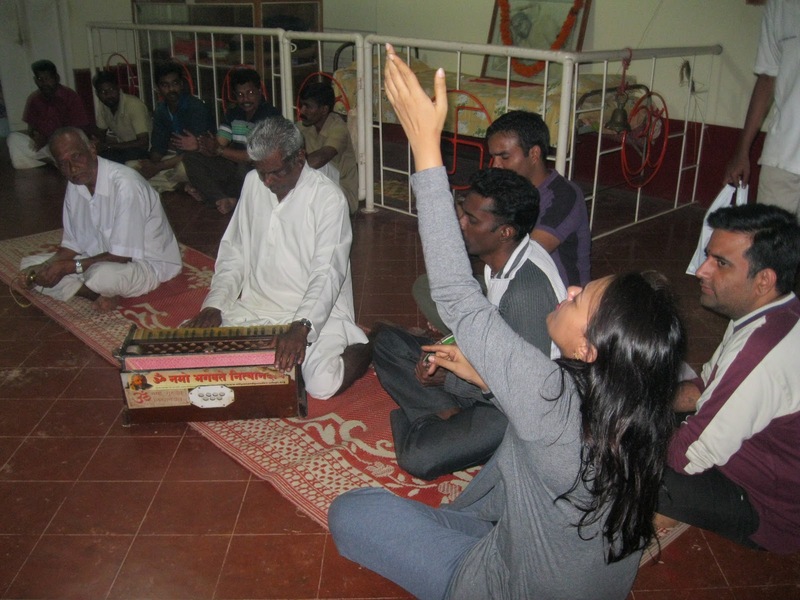 i quietly went and sat next to them and he pitifully looked at me and guessed it right :) He gave me the tambourine and soon some of us joined there and it was a brief satsang as he allowed us to sing and join him in his music. We sang few songs. Then we left from here and while searching to buy flowers both vehicles lost contact with each other and since me, uncle, Vidya and Akash were not carrying cell, we could not contact them neither could they contact us. We went to Anand ashram while they had gone back to Nityananda ashram. When we reached Anand Ashram, we were asked to have food there itself and we thought it was wise because by the time we return the Bhandara at Nityananda Ashram would close. So we took the coupons and had food. We then went to the sankirtan hall and sat there. We sat there close to an hour lost in the chants of "Shri Ram Jai Ram Jai Jai Ram...." i was completely immersed in the peace and radiations of those high vibes there. These experiences of these places are indescribable :) Akshay brought me back since it was already 9; i didn't want to :) As we took leave a lady called us in and showed us Papa's (Swami Ramdas) room which was again like a place where you could stand and meditate. She asked us about our whereabouts and invited us to come the next day so that we would be able to meet the current spiritual head of the ashram. We hoped we would and took leave. 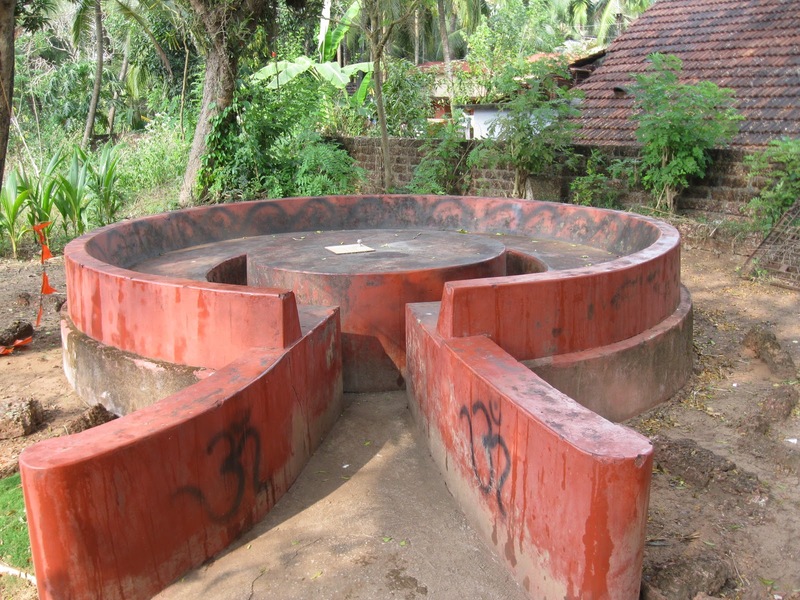 Some more details of this ashram has been covered in previous article. Papaji once mentioned that Bade Baba was once brought in by one of the ashramites and all gave him due honor and made him drink the cool water of a tender coconut. After remaining with them for about 10 minutes, he went away, and all the while never spoke a word. This great Master hardly spoke and even if he spoke it was in bits and pieces in trance since almost all the time - walking, sitting, eating, etc, he remained in samadhi. Tulsi Amma a great devotee of Bade Baba was the one who made efforts in writing down whenever Bade Baba spoke and all his teachings are due to her efforts and some efforts of a few other devotees. When we reached back we found all the rest were still awake. Vidya on the way back had plans of doing Sri Vidya after going back. Soon, we were all up at the Nityananda temple above. It was around 10:30 p.m. and we all sat on the marble floor on our asanas and began the Sri Vidya sadhana. By 11:30 we were done with and sat talking till about 12:30 a.m. We very well knew that next morning we had to get up at 4 a.m. since we had the milk abhishekham for both Baba Nityananda as well as Baba Janananda (disciple of Baba who had taken care of the entire ashram after Bade baba went to Ganeshpuri). We walked to our rooms and by 1 a.m. jumped into beds keeping the 4 a.m. alarm. Only after 3 hours of sleep, we were up by 4. It was 4:15 a.m. while I got up and just then Vidya walked and woke the rest of us. She was fully ready. Vidya is highly energetic being who can be in meditation and sankirtan even round the clock :) By the time i dragged myself around still with half open eyes and got fresh and reached the temple it was 5 a.m. The abhishekam was a very powerful one because this is the only time you can actually enter the temple where Baba's powerful panchaloha idol is seated. We all took turns to pour milk over the idol. 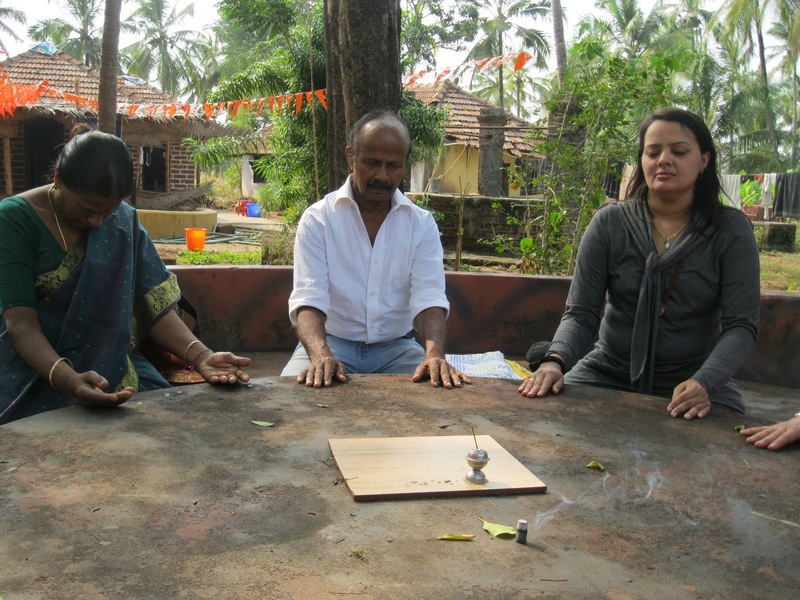 i am personally not very keen on rituals but then yes, the emotions that run during even these rituals are high. Touching Baba's idol itself is something because there is so much in that small square room. This was my favorite place in the entire ashram and today i had the opportunity of giving touching HIM. i could not hold back my tears as my hands trembled while pouring the milk over his head and body. i cannot explain what happened but it's between nothing to everything! After this we did the abhishekham at Baba Janananda's shrine down and were having our breakfast. Me and Vidya took turns to playing the drums at the temple and sometimes ringing the bells while the arti was going on. During arati the sound of drums, bells, gong and the pooja bell turn into celestial music. But the music at the early morning kaakad arati at Ganeshpuri is one of the best to experience. I have seen shaktipath happening there in Ganeshpuri during kaakad aratis. The entire place just vibrates into heavenly atmosphere. The music here reminded me of Ganeshpuri. Soon, we had breakfast and gathered for the Mruthunjaya Homam. This was our last day here and as usual my urge to spend more and more time with Baba came in again. We just sat there above. Meanwhile others who had missed going to Anand ashram the previous day decided to go. They left while me, Akash and Vidya stayed back. After sometime, Vidya remained upstairs singing bhajans while me and Akash went into the caves. After a while i got to read a few pages of the wonderful book i had carried with me this time "Himalayan Lust" by Sadguru Jaggi Vasudev, a very beautiful book. After lunch we three lost contact with each other. By late afternoon others also returned and all got ready to leave. 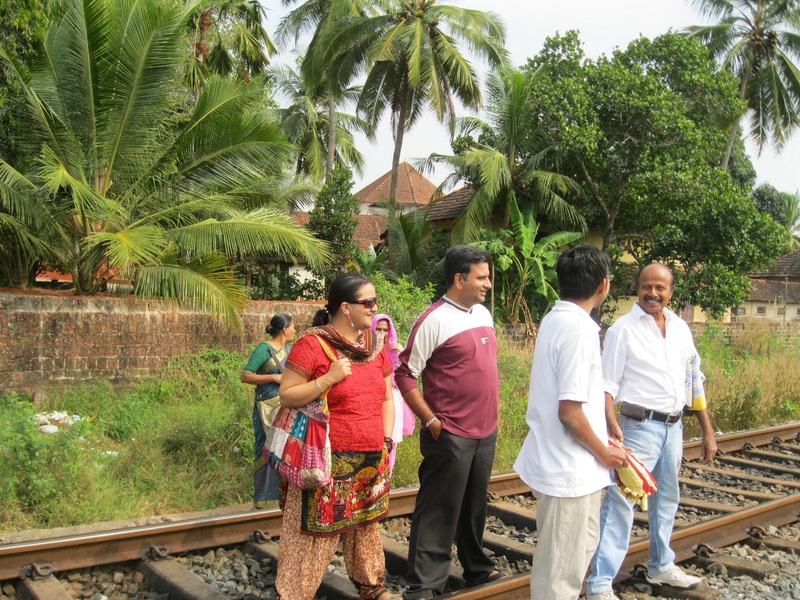 All had their trains back to Bangalore while me, uncle and Shabnam had to move in his car to Mangalore from where i had my bus back home and Shabnam had her flight. Inspite of bags packed and everything ready, all moved around here and there, probably to have a last glimpse and blessings. Some were emotional and some wanted to stay back. Every time when the hour of leaving approaches i have noticed that i love the place even more. Suddenly Ravi was not to be seen around and someone told that he is with some Swami who had come there. i moved around just feeling those energies before i left and at that time Ravi came and told me that he had met a Swami and showed the card. The moment i saw the card i was shocked! This was the same Swami Ganapathyji had last time told me he would make me meet while we were in Padiyar Swami's house and he had never told me who and where and when. This was the same thing i had left incomplete in my last visit here and here before i was to leave it completed. Two weeks ago Ganapathyji had gone to this Swamiji's ashram in Bailhongal, Karnataka and had given me a call to come over but i was just returning from the Kurukshetra shivir and could not go there. Then on Ganapathyji's way back home, i had the opportunity of meeting him while he passed through my place and he had given me the card of the Swamiji whose name is Swami Vijayananda and told that this ashram was established 25 years back. I had even spoken to this Swamiji on phone who had invited me then. Now, i was shocked to see the same card in Ravi's hand, which meant that he was here! i ran to the room where he stayed and introducing myself took his blessings. Swamiji immediately gave me three CDs. It was then that i realized that here is the author of so many Kannada books on Baba Nityananda that were sold in Kanhangad ashram. We were very happy to see each other and he again invited me and said, "There are many festivals, functions and events that happen at our ashram......" Before i could nod my head to his invitation he continued, "Do not come for these. And, do not come in crowd. Come only to do dhyana. Everything happens with His wish and grace if the intention is that." By crowd he did not mean the count of people, but to have one-pointedness (ekagrata). 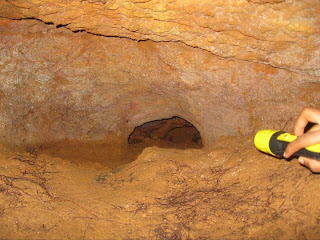 He said that there are constructed caves there also and everything happens there with the grace and power of Baba Nityananda and that many people have had their shaktipath there with His grace. i cannot stress enough on the mysterious ways Bade Baba works through such subtle wonders. As Swamiji 'reminded' me that one must go to such places only to do dhyana, i would like to add that i have always noticed that Bade Baba wants just that - no rituals, no songs, no praises, no glorification, no pujas, no dhoops, no mantras, no chants, no formalities, nothing! He just wants one's presence or call it presence of mind. He just wants one to be aware of every moment, just be there in His presence. No doubt, there are all forms of pujas and havans and rituals in every temple of Baba Nityananda or elsewhere, but it is my personal observations that these are done in the form of Guru bhakti which is also never wrong and it does help one greatly, but much beyond everything is being in His lap and just staying in His presence, just bringing the mind to the present by chanting internally "Om Namo Bhagwathe Nityanandaya", just by merging oneself in Nityananda for Nityananda is not His name but the state of being in which he always was while being in the physical body. He wants nothing else for He cannot be impressed because one can only impress that which is separate and in the dual form. With this bhaava if one approaches Kanhangad or Ganeshpuri i am sure there will be lot of things happening. i am not perfect in this but it does work wonders when it happens and it is my effort that i use it in all my spiritual travels. Swami Vijayanand also told me that he had just come from Mumbai and was leaving soon. i was very happy for this last-moment spark at the time of our departure and thanked him and Bade Baba. Taking his leave, we left the place. We three reached Mangalore at 8:30 p.m. and as always at his place aunty fully packed my stomach with her lovingly made dinner. Then, Uncle and Shabnam came to drop me at the bus joint. All others who left by train reached Bangalore by 8 a.m.
Uncle stopped for a while at the shore by the road to Mangalore. A big warm hug to every soul who had come for this tour, thus making it so loving and joyful as we celebrated every moment being with each other and being in the Presence of the Master for three lovely days. The moments shall be cherished forever. Thank you! A few hours before publishing this article, i got a call from Ganapathyji who reached the place i stay enroute his walk from Kanhangad to Ganeshpuri. i was very excited to meet him and could not thank him enough for helping us with the trip and arranging for the house of Padiyar Swami for us (he stays in this house and looks after). He shared a few interesting things when i narrated what all we did in Kanhangad. He was happy when i told him that this time we could explore the caves of Guruvan a little more deeper. He said the hole that is there at the depth of the cave is actually the entrance to a very large cave and there are mystical things there, which is an entire world in itself. He said only people to that level could go beyond and till where we went is where the normal world stops at. He said there are beings moving in and out all the time and all this could not be perceived or understood by people. I was wondering how Bade baba would have been going through here during his sadhana days and he said "what is not possible for him?" I told him about the frogs that suddenly appeared and looked at us and he said every stone there also could be saluted at because you never know in what forms beings come to give darshan there. He further said that there are everything in there and snakes are seen commonly. i haven't seen one till now but many have told me that this place is full of snakes, but they do not do anything. 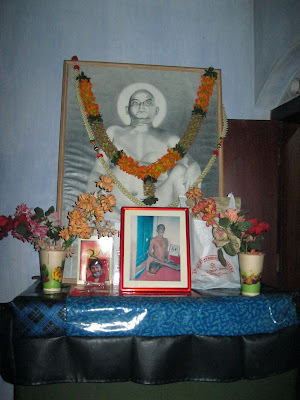 Swami Vidyanand, who lives here, last time told us that he had stepped four times on cobra but they never did anything. He moves around here in pitch dark for early morning 4 a.m. arati of Bade Baba. He said that those who go there with trust and faith, everything goes fine. In our last time's visit we had stayed overnight here. He added that there are many who had come there for sadhana and have had mysterious scary experiences and run away. When i looked with raised eyebrow at him, he said that it is only when one goes there with the feeling that "I am nothing but everything is He" all goes fine but if one feels "I am the doer" then they have such kind of experiences. He was happy to know that Vijayanand Swami had come to Kanhangad and i had the opportunity of meeting him. After about 40 minutes with him, i took his leave. He was just as he was always - a thin person with long black hair and beard wearing a shirt, a lungi (single piece of garment worn around the waist), and bare-footed. He had walked 530 kms and was now proceeding to Ganeshpuri which is about 600 kms from here. With total simplicity he bid me goodbye and walked away. i just came back and thought i could add this piece also before publishing this post. Om Namo Bhagwathe Nityanandaya. To go back to first post click here.